An original chest of drawers designed by Dorothy Draper surrounded by items making it reminiscent of The Greenbrier. POINT PLEASANT — Individuals will be able to enjoy an evening out filled with art, filled with community. The Dorothy Draper Design Expo will begin at 6 p.m. this Thursday evening ending at 9 p.m. The event will be held at the Gallery at 409 along with refreshments and entertainment for the guests. Designer Jimmy Hobbs shared the inspiration of the show developed after Ruth Finley obtained an original chest of drawers made by Dorothy Draper for the Lowe Hotel. The chest of drawers was acquired from The Greenbrier, which is located in the Allegany Mountains in the White Sulphur Springs of West Virginia. According to its website, The Greenbrier is a national historic landmark and world-class resort which has been welcoming guests from around the world since 1778. Hobbs explained he asked those who attend the weekly Tuesday painting gatherings at the Gallery at 409 to look at the chest of drawers, then paint a piece in honor of West Virginia. The group started with rhododendrons, as they are a symbol of The Greenbrier. As the pieces of the show came together, reflections of Dorothy Draper, The Greenbrier, and the state of West Virginia could be seen. Hobbs then wished to draw those of the community into the show as well to emphasize beautiful items can be purchased locally. Along with art in the show, Hobbs decided to also incorporate furniture, sculptures, and decorative items in order to present all of the different items together. He wanted to show the guests the way they would be able to incorporate the art within their homes. He sought out local businesses of Point Pleasant, such as Decor Corner and New to You, as well as businesses of Gallipolis, Ohio, including the Movie Station, Buckeye Vine, and The Home Place. He commented all of those who contributed items will be receiving the profit made from the item. “It has been a wonderful experiment going to different venues and explaining what we want and they have been so generous…it has been a wonderful community effort,” said Hobbs. He commented several pieces of the show have already been pre-purchased, but many still remain. Hobbs extends an invitation for inspiring artisans to come by Gallery at 409 on Tuesday evenings from 5-10 p.m. to paint, snack, and socialize with area residents, free of charge. He commented the group is typically comprised of 9-18 people. Hobbs explained his appreciation for Finley’s vision and her mission, opening up the Gallery at 409 for the community as well as letting artisans gather together weekly to work their painting chops. 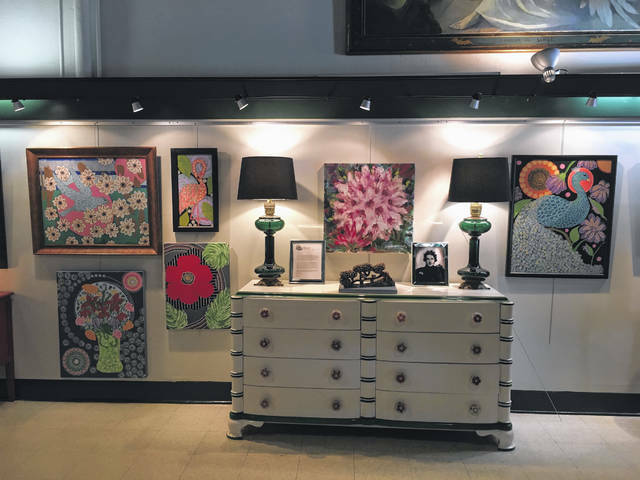 https://www.mydailysentinel.com/wp-content/uploads/sites/14/2018/08/web1_0807-2-.jpgAn original chest of drawers designed by Dorothy Draper surrounded by items making it reminiscent of The Greenbrier.